· Once the link has been added to the download list, the files will be downloaded while you navigate and if you close the download program, the downloads will be restarted when you start the program again. · Control how many files can be downloaded simultaneously from each server..
· Many of the files hosted in free servers are divided into parts, Mipony has the option to join the downloaded files (HJSplit). · Mipony can capture from the clipboard individual links or any text that contains any number of links. · If by any chance the file shows an error during the download, Mipony will be in charge of performing the necessary attempts automatically until the file is downloaded. · It has an embedded browser from where the download links are detected. · Automatic update of the data base with the sites supported. 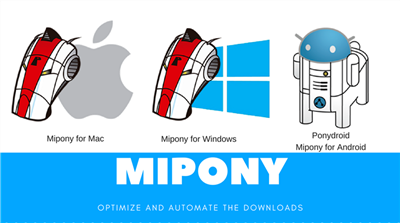 Mipony updates automatically to keep working with files download sites and it is constantly adding new sites to the supported websites. · Mipony can analyze full sites looking for links, indicating if they are still available in the server to be downloaded or if they have been erased. · In a bar format to launch downloads from Firefox and Explorer directly to Mipony or to open the site that is being viewed in the browser of Mipony. · Mipony has a web interface to control it remotely. With the web interface you can view the downloads and manipulate them, and also you can enter the captcha codes remotely. The web interface design is adapted for both desktops and mobile clients. · With this plugin, you will have access to the captchas decoding system developed by captchatrader.com. CaptchaTrader solve captchas for you so you don’t have to. If you earn credits by solving captchas then you can spend them later when you need them.